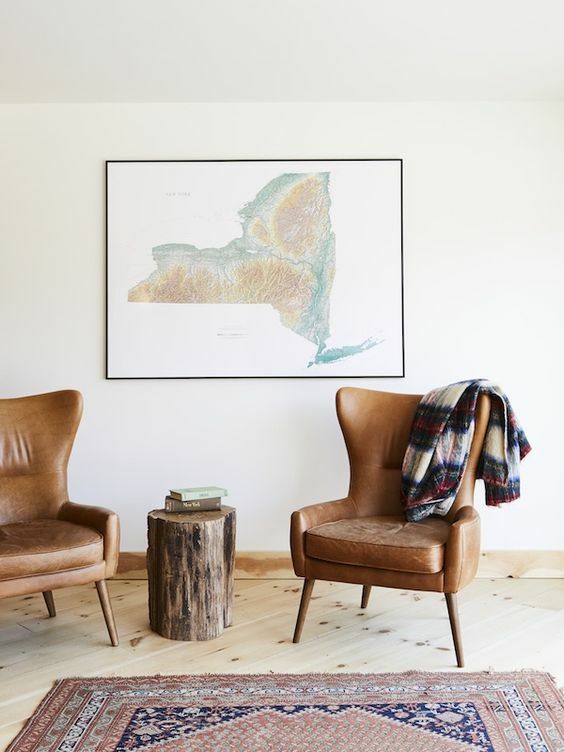 How to Create Summer Cabin Vibes | Havenly's Blog! I grew up in the midwest, where summer is a special time. I’m talking lakes, woods, cabins, and sleep away camp. Yeah, those things exist everywhere, but there’s something about the lush green summer that sets in over those middle states. While I’d love to spend this entire summer back on the shores of Lake Michigan, the reality is that I have a job and can’t just Walt Whitman the summer away in the woods. So, in an effort to bring out that same ultra-relaxed feeling, I’ve been pulling together tons summery, cabin-y, woodsy style inspiration. Would you bring this breezy style into your home for the season? I’m all in favor of it. 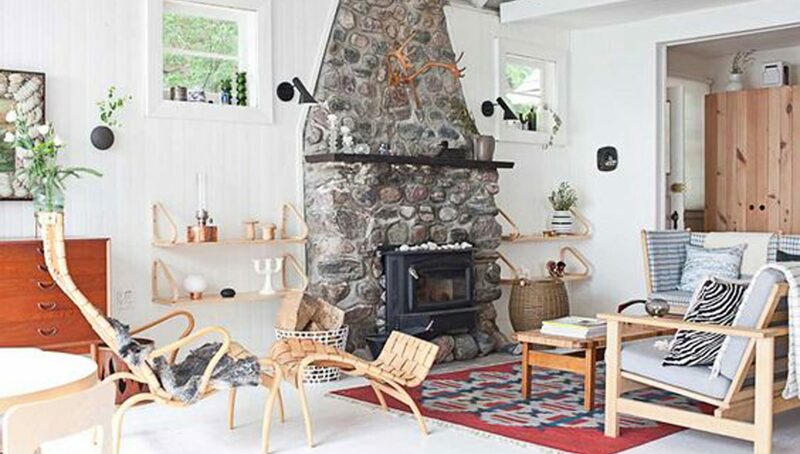 I think one of the best qualities of summer cabin style is the light. The feeling of being outside, even when you’re inside. I would die for these wrap around windows, but in the absence of a structural renovation of my house, I’ll be pulling down my curtains for the season and letting the light shine on in. Can’t you just feel the cool breezes looking at this photo? I think another huge draw to this easygoing style is how unstudied it feels. Pieces don’t have to match perfectly, hand-me-downs are encouraged, and somehow it all just comes together. I especially love the worn look of older rugs, and the natural feel of unfinished or scuffed up wood. Traditional wool fabrics like plaid or pendleton stripes always look great, and transition well into other seasons. 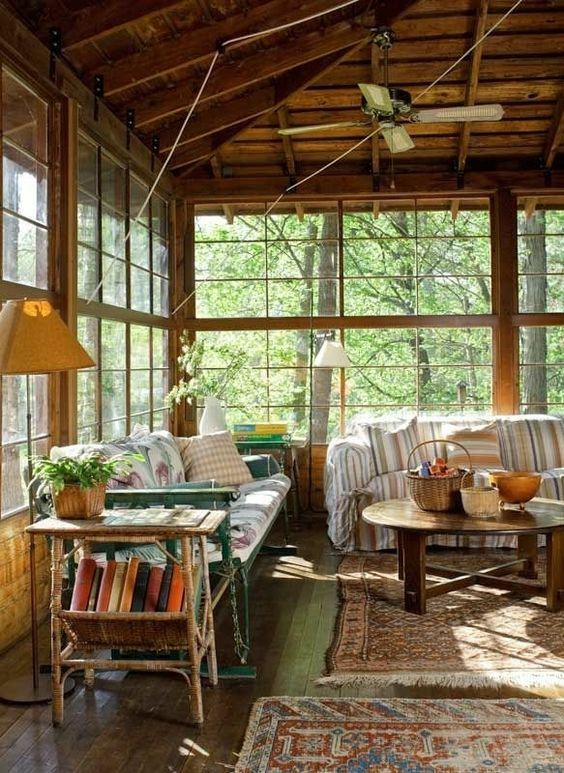 Yes, opening the windows wide brings the outdoors in. 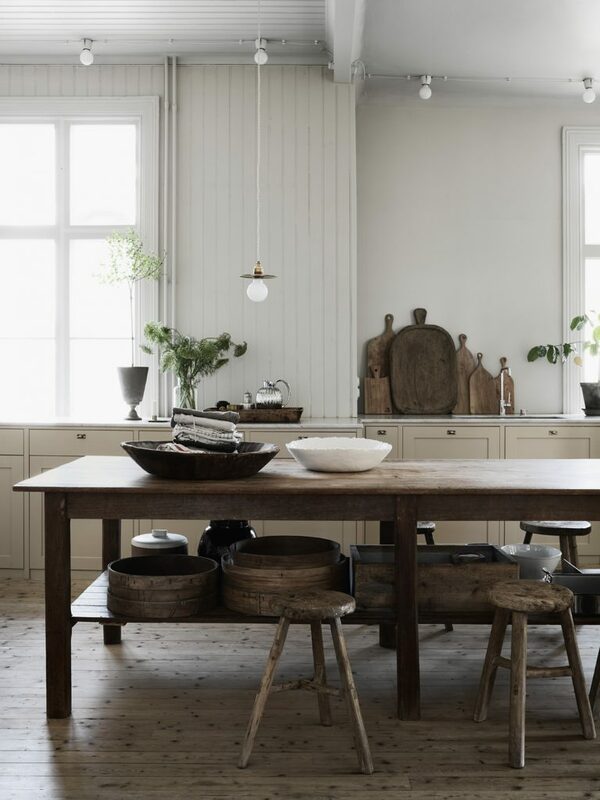 But the natural feel also comes from plenty of rough-hewn, artisanal touches. This photo is the perfect example of embracing imperfection: that work table feels like it’s been in use for a century. Even a few simple accessories can create this aesthetic: wooden bowls and platters, ceramics with natural finishes, and plenty of greenery will do just the trick. Summer homes are known for how they cram as many beds as possible into a small space. This photo alone is enough to make me want to go back to old-school bunk beds. I love how this room uses classic camp-style bunks but adds fluffy linens and classic paisley to create a warm, inviting feel. Feeling inspired? We’re here to help make your cabin dreams into reality. Get started today!